On November 24, researchers from the French Institute of Oriental Archeology (IFAO) and the University of Strasbourg announced the discovery of two beautifully preserved sarcophagi found in El-Assasif, a necropolis that was located on the west bank of the Nile across from the ancient city of Thebes. In the modern-day, the ruins of Thebes lie within the city of Luxor. In a statement, the team report that one sarcophagus bore writing proclaiming its occupant to be a woman named “Pouyou” or “Pouya”. Made of wood covered with painted plaster, the ornamental coffin is about 2.1 meters (6.9 feet) in length and is intact save for the very tip of the feet. Judging by a preliminary analysis of the style and the woman’s name, the archaeologists estimate it to be more than 3,000 years old, dating back to the 18th dynasty (1549/1550–1292 BCE). The other sarcophagus, found by the first’s side, has no name inscription and only a decorated lid, likely due to someone switching out the base at some point. It has been dated to the 17th dynasty (1580–1550 BCE). Both sarcophagi were opened for the first time at a press conference with Dr Mustafa Waziri, head of the Egyptian Ministry of Antiquities. According to a release from the agency, one of the two coffins – though it is not clear which – contained a linen-wrapped mummy in good condition. Investigations of the remains are expected to begin shortly. At the same media briefing, Dr Waziri broke the news that one of his agency’s archaeological teams had recently discovered two tombs in a nearby area of El-Assasif. Unearthed during a five-month excavation project at the site, the first tomb was engraved as belonging to a person named Thau-er-khet-f, an assistant at the Temple of Death, and contained multiple bodies, seemingly those of Thau-er-khet-f’s wife – “Ta-Kharu” or “Sekhmet-Nefert”, according to text on the walls – and children. 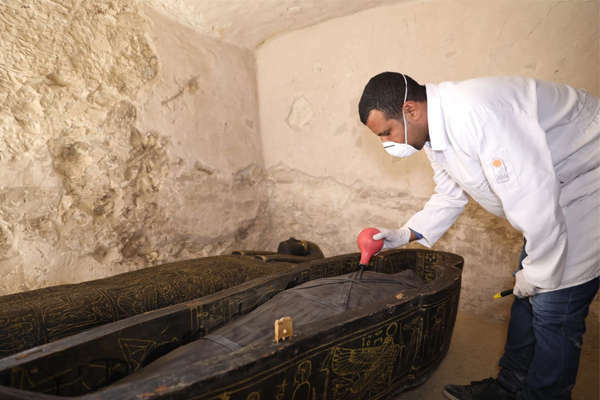 The other tomb reportedly contained two wood coffins, which bear text declaring that one belonged to a “B-D-East” son of “Nes-ba-Ruti”, and the other to a woman named “Nes-Mut-Ankh”. Alongside the human remains, the ministry team also found more than 1,000 wooden funerary statues (called ushabti), lanterns, masks, and a papyrus fragment from a copy of the book of the dead. To make this week even more mummy-packed, another new finding was made public earlier today. As reported by a ministry statement, an archaeological mission excavating a section of the Dahshur necropolis uncovered eight limestone sarcophagi with mummies inside. Located in the desert off the Nile’s west bank, about 40 kilometers (25 miles) south of Cairo, Daishur is known to be a royal burial site. Though it also contains numerous underground tombs, the necropolis is famous for its five pyramids. 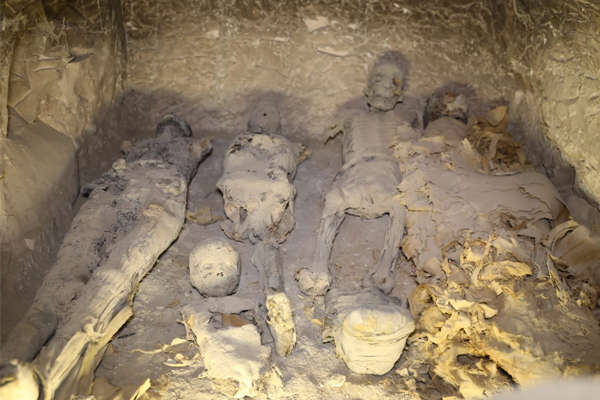 Found in the area southeast of the White Pyramid of Amenemhat II, all eight sarcophagi are covered in a layer of painted plaster and have been dated to the Late Period (664-332 BCE). Three are said to be in good condition. The artifacts are currently being stored and conserved at an antiquities warehouse but will be put up for public display at soon-to-open museums in Hurghada and Sharm El-Shekh.